Up to this day in the area of Riga there still exist some 42 - 44 historical manor houses of Riga householders and nobleman. Unfortunately major part of these buildings are endangered by future plans envisaging demolishing of manor houses, by neglect leaving them abandoned, by lack of knowledge which leads to rebuilding beyond recognition and transformation of landscape. It is surprising to see that some 15 of these monuments have not been included in lists of protected monuments. It is true that these buildings are partly protected by other norms but the fact is there - these monuments have not been recognised as being special. Author considers that this is just weird. There are weird things going around the Hamann manor house built in 1886. Manor house is located in exceptional place next to active street - Slokas Street. 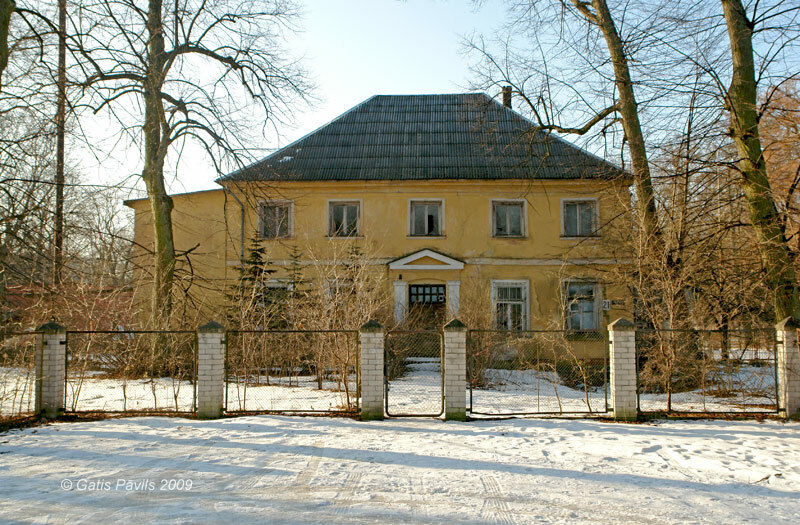 Expressive manor house with small park next to it could be a main attraction point for this area and praid of Riga. Riga city rented it out to entreprise "Mono" in 1999 - of course, with promises that it will be tended to be nicer and more interesting. Years went by and the affluent company did not do anything, wooden building stood abandoned and visibly decayed. In August 2007 there was a fire. Society was indignant anf the slow machinery of bureaucracy started to look for ways to stop the lease agreement. In the beginning of 2009 there was started a process to break the agreement but now - at the second half of 2009 it looks that the opposite process has started and there is concern that those who neglect this building will be given rights to complete the destruction of monument. Building is listed as monument of architecture. New manor house of Bierinmuiza was built in 1870. Once upon a time it was beautiful and especially beautiful was the park in Marupite valley around the manor house. It is possible that the building of manor house is not directly endangered today. But there are two disturbing tendencies. First - manor house itself has been transformed beyond recognition over the last decades and now looks like usual, shabby wooden building. Condition of the building is bad. When looking superficially it may seem that this building has no value and can be surely demolished to build something new and larger instead. Second - there is changing landscape around the building dramatically. Some years ago there was forest - former park - around the building. Now it is quickly covered with buildings. Currently there is constructed a house between the manor house and Kantora Street - now the manor house will be covered from the eyes of casual observer. The new Bierinmuiza manor is not listed as monument of architecture. 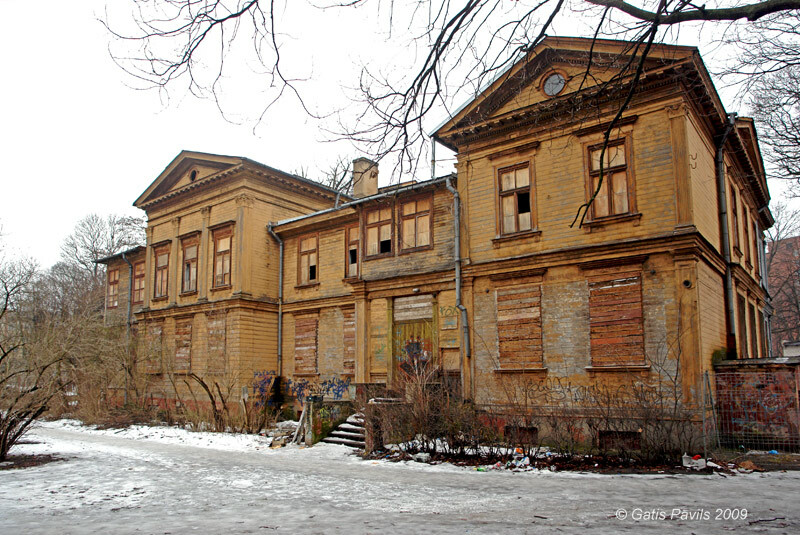 Senbergi manor is built in 1906 and represents a unusual and beautiful monument for this part of Riga. Currently the building is still inhabitated. The building is in a rather bad condition - but it is included in this list due to another reason. 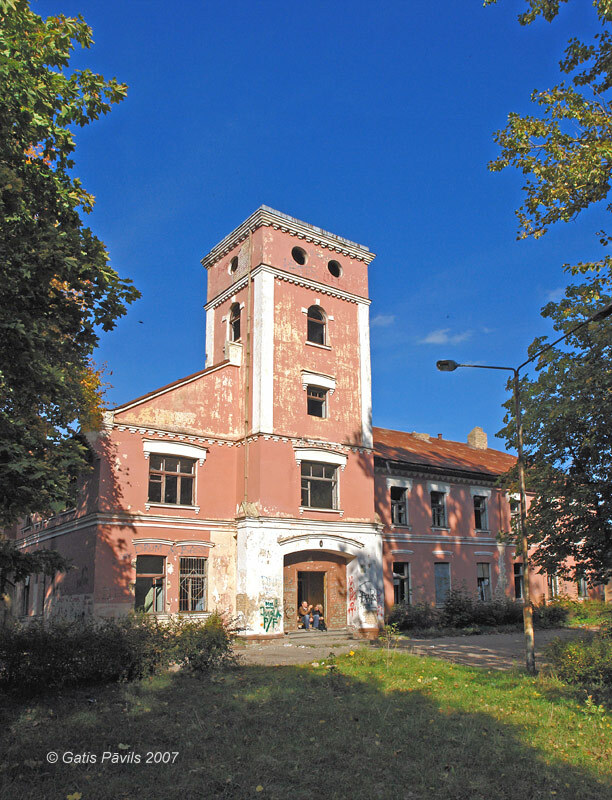 As the author was informed by local inhabitants, current owner of manor considers this building to be an obstruction and wants to build a multiapartment building instead. Who knows - if there was no crisis, there would be no manor house anymore. And crisis will not last forever. Senbergi manor is not listed as monument of architecture. Breksi manor house is built in older manor centre in late 19th century or early 20th century. The building with its high tower and beautiful park could become one of the most beautiful and interesting buildings in this part of Riga. Owner of the old manor centre has an intent to build new buildings in the park. In 2005 there was announced a tender on architecture for the development of this area. Architects themselves sometimes recognised that it is not especially nice to support this idea but there were received ideas at least trying to replace existing values with other ones. It should be noted that there were no plans to demolish the manor house building. It happened that there did not happen futher actions and the building stood abandoned. In the spring 2008 part of the building was devastated by fire and since then it is guarded more closely. Most likely owners wait for the end of crisis to continue their construction plans. Breksi manor is not listed as monument of architecture. Dresden manor has been built in late 18th century and belonged to the group of Pardaugava manor houses where lived outstanding intellectuals of Riga from early 19th century. Nowadays this building is nearly abandoned. It is located next to Daugavgrivas Street. This street is the reason for the expected loss of this manor house. In order for Riga harbour - feeder of city - to develop more successfully, there is planned to extend the street in coming years and to demolish this building. Contrary to other cases here this sacrifice will have some sense. Still - the situation could be partly saved by somebody who would relocate this building elsewhere. But - may be it is possible to have the transit street elsewhere? Dresden manor is not listed as monument of architecture. Kregermuiza manor near Jugla Lake. Neo-Rennaisance style Kregermuiza manor house is located at the steep coast of Jugla Lake. Few could imagine that in Riga City there is such a grand view as seen here. Surprisingly none of contemporary wealthy people did justice to beautiful views, extensive park and the fact that stone house from late 19th century is well suited for present day needs. The building is collapsing and in a few years may turn in ruins. Kregermuiza manor is not listed as monument of architecture. Unbelievable, unique monument of history and architecture is Little Jumpravmuiza manorhouse. Since the middle of 13th century it has governed major areas of present-day Riga and surroundings of Riga. History of manor has been little investigated but it is very interesting. Even more surprising is the beautiful locations - who could have known that in Riga there is a place where opens a nice view from the high coast of Daugava to floodplains and the enormous river passing by with just a few faraway buildings in sight! None needs these values today. 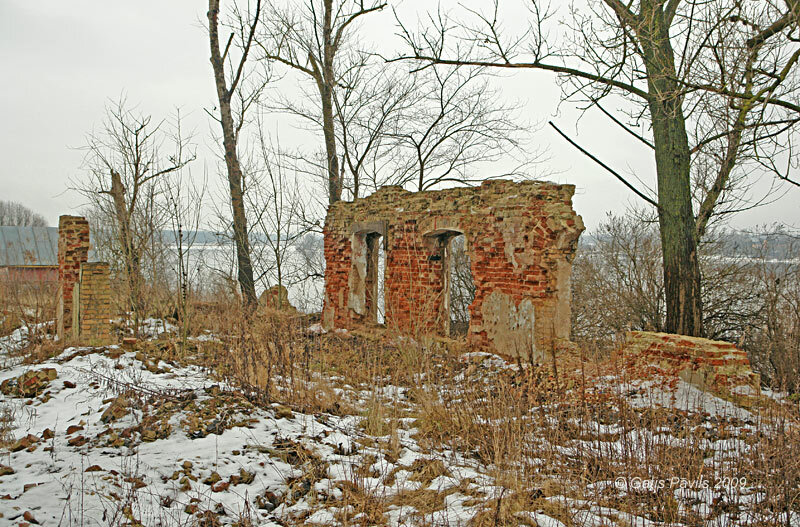 Some time ago it was possible to renovate this manor house - now there are only ruins. 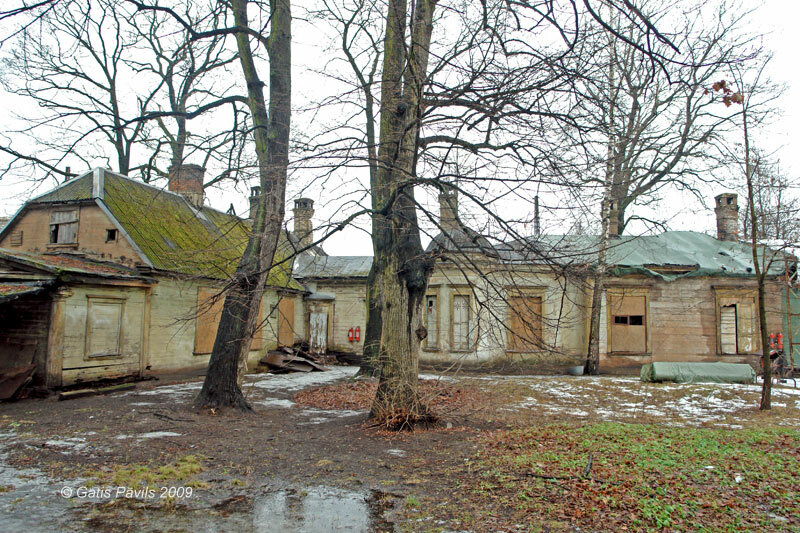 Ancient manor house could be saved only by a miracle. 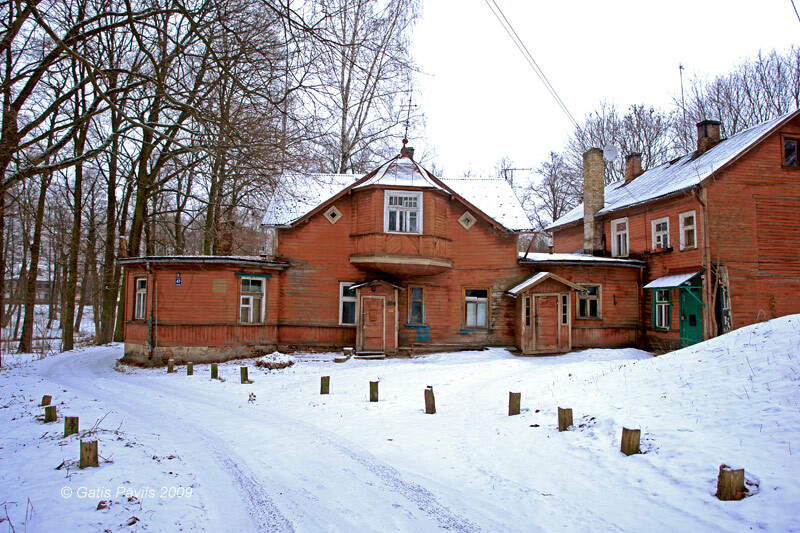 Little Jumpravmuiza manor is not listed as monument of architecture. At the edge of vast Spilve meadows towards Dzirciems there stands small dune ridge. Most Rigans don't know this picturesque place. Since 17th century there stands a manor house. 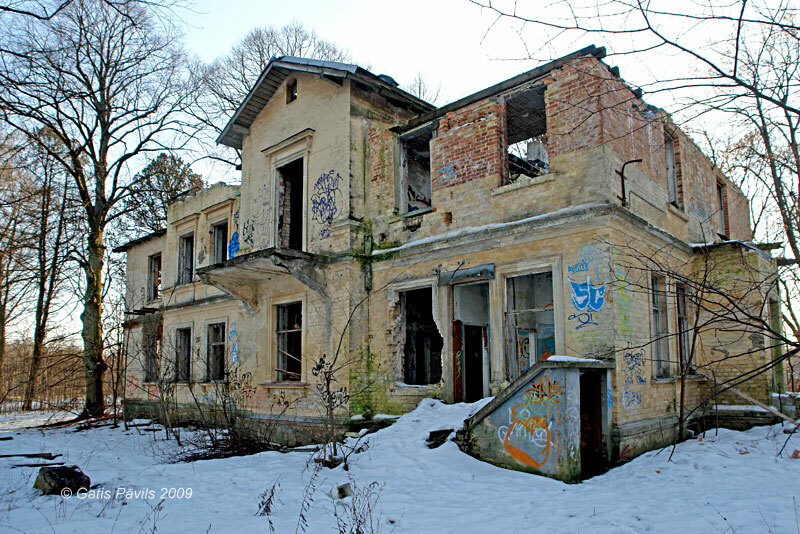 Nowadays this remote manor house has not been completely abandoned - it looks inhabited and guarded. But there are few places with such untidiness as seen here. There is impression that current owners of manor understate exclusiveness of this property and there is risc that manor house could become a victim of this incomprehension. Essen manor is not listed as monument of architecture. It is likely that this large wooden building is not a manor house but resort building from the second half of 19th century. Anyway this monument of architecture is visually impressive beautiful building which could brighten up the monotonous district of multi-apartment buildings. Wooden building is hidden by higher buildings from all streets. In last years there were started large scale repairs - it was planned to create office premises here. Unfortunately crisis has changed these plans and the building stands abandoned. Piladzbirzs manor is listed as monument of architecture of local importance. At the beginning of 19th century Ebelmuiza with its spacious landscape park belonged to the most ornate manorhouses in Riga. Surprisingly both the manor building and park have survived up to this day but there remains little of the former beauty. Ebelmuiza park with its noble oaks is tended - this resembles an endless work of Sisyphos as in surrounding multiapartment buildings there are living numerous vandals. 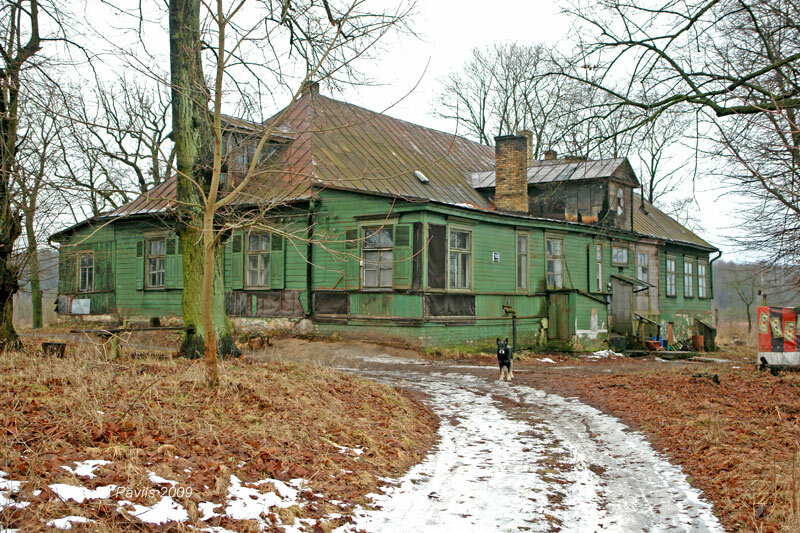 Ebelmuiza manor house nowadays resembles a simple house from the first half of 20th century, it is partly abandoned and neglected. 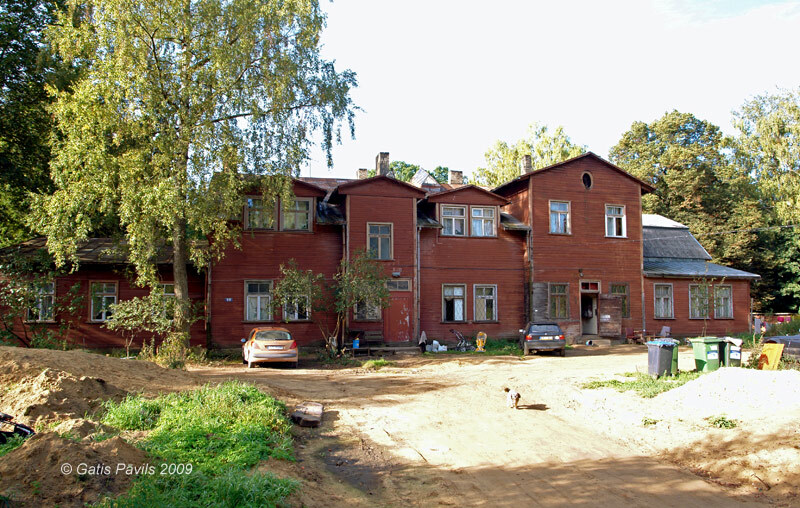 There are numerous sad cases in Riga where such semi-abandoned buildings turn into shacks in short time and are demolished. Ebelmuiza manor house is listed as monument of architecture of local importance.